The very first time I heard Archbishop William Lori preach was during his mass of installation, at the Cathedral of Mary Our Queen in Baltimore. I was very impressed with the first words he delivered as the leader of the Baltimore Church. Since then I've had a couple of opportunities to serve with him and I continue to be impressed by his preaching. 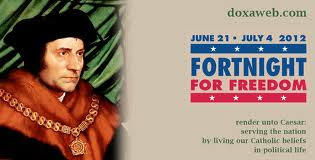 In this memorial of St Thomas More, a man who was martyred because he refused to yield to the demands of an unjust monarch, I think it is fitting to take a quick look at the highlights of Archbishop Lori's homily for last night's mass celebrating the beginning of the 2013 Fortnight For Freedom campaign. Once again Archbishop Lori was presiding and, once again he was not pulling any punches. Here are some highlights from his homily. I'm trying to get the complete text as I have only found excerpts, but judging from what I have seen, once again, Archbishop Lori delivered. I'm very proud and happy to have such a courageous man as my bishop and spiritual leader. St Thomas More pray for Archbishop Bishop and for all of us.